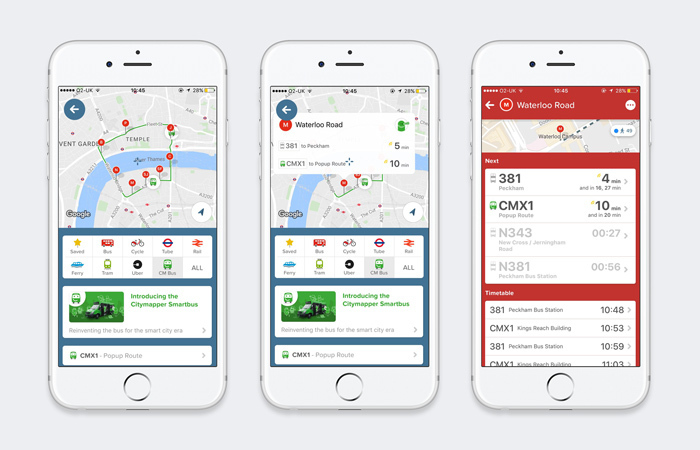 As the transport app launches an experimental bus route in London, we consider how responsive buses will impact passengers and public transport. A human catapult? A real life jetpack? A Snapchat-inspired Stories feature? These are just some of the suggestions made by Citymapper users on Facebook about the transport app’s much-anticipated product launch. However, in a Medium post published yesterday, their guesses were proven wrong. Instead, the tech company revealed that it has been investing its efforts in developing a bus. The pop-up route is the first step in its plan to design smarter urban transport systems that respond to passenger demand and local conditions in real time. 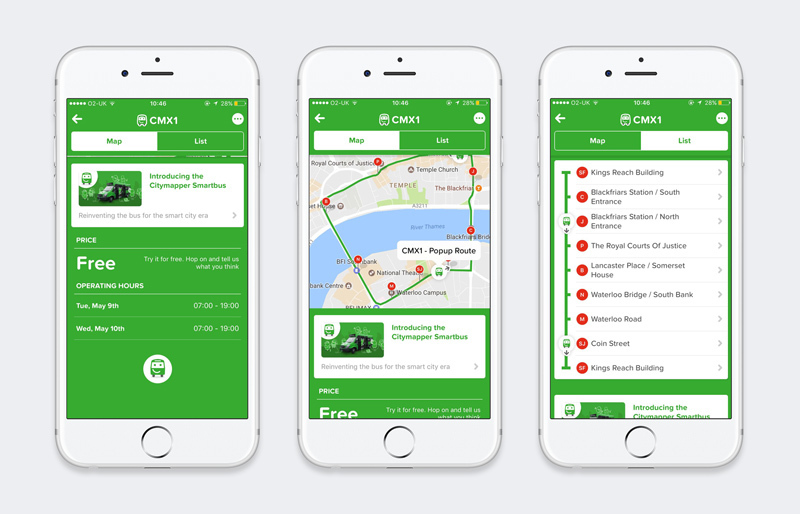 Named CMX1, the bright green buses are running on Tuesday 9th and Wednesday 10th May in a circular route through Southwark, Blackfriars and Waterloo Bridge. For now, the buses use existing stops, and arrival times are displayed on TfL’s departure boards alongside regular routes. 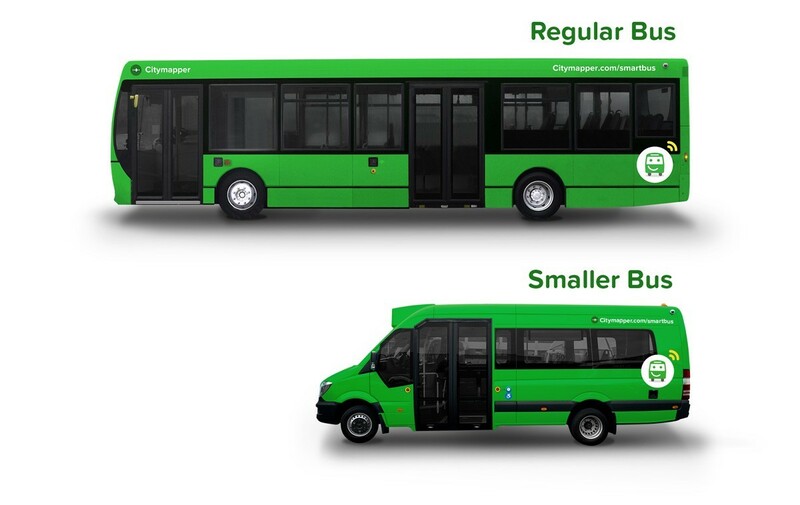 But the move is part of Citymapper’s broader ambition to develop “responsive buses” that cater to commuter behaviour in real time. “When we studied the existing public transit routes, we realised that they don’t always serve people best, nor evolve quickly enough to accommodate changes in the city,” Citymapper CEO and founder Azmat Yusuf told Wired. Using an internal simulation tool nicknamed “Simcity”, the company is working to optimise existing routes and identify new ones by analysing demand data gathered through the app. It’s goal is to run dynamic routes that change in line with commuter demand, as well as services that call at regular stops, but adjust their course in between to avoid traffic. The buses being trialled are smaller, “nimbler,” and operated by human drivers, who use custom software to access live updates on passenger numbers and local traffic. 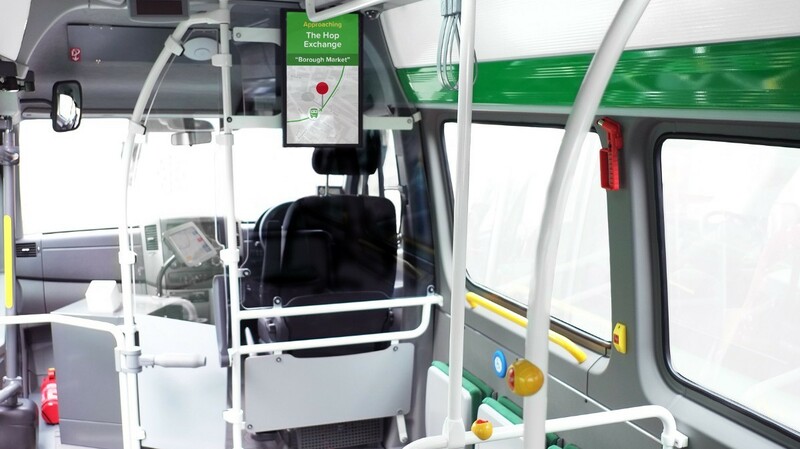 While commuters can track their journey’s progress on a display screen, as well as via the Citymapper app. The route is also “multimodal ready,” meaning it can combine with tube, rail and other bus services as part of suggested journeys around the city. Offering the best routes in real time by analysing open data shared by Transport for London (TfL), Citymapper first launched in the capital in 2012 and now serves 40 cities worldwide. It takes care in its announcement to emphasise that TfL is “supportive” of the move, and notes that both parties continue to “mutually think about the future of the bus in the city.” But the project throws up an important question: whether ride-sharing competes with, or complements public transport. By giving passengers price incentives to share rides, and prompting them to meet at optimised pick-up points, UberPOOL is making journeys more cost efficient to deliver, but threatening to cut in on public services too. In fact, the local transit authority in a Florida suburb last year stopped running two under-used bus lines and begun subsidising Uber rides instead, in an effort to solve the “last mile” problem. And both Uber and Lyft have since partnered with a number of local transport agencies on similar subsidy schemes. However, with a population of 8.7m and the worst traffic congestion in Europe, the issue facing London is not the lack of demand for public transport services, but the abundance of it. The solution, Ashtari told Wired, lies in the continued collaboration between the public and private sectors, to advance the development of smart infrastructure for cities.